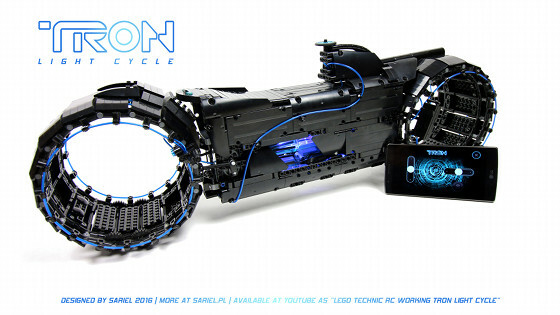 Model of a light cycle from the TRON movies. Features drive, steering and custom lighting with flickering core. 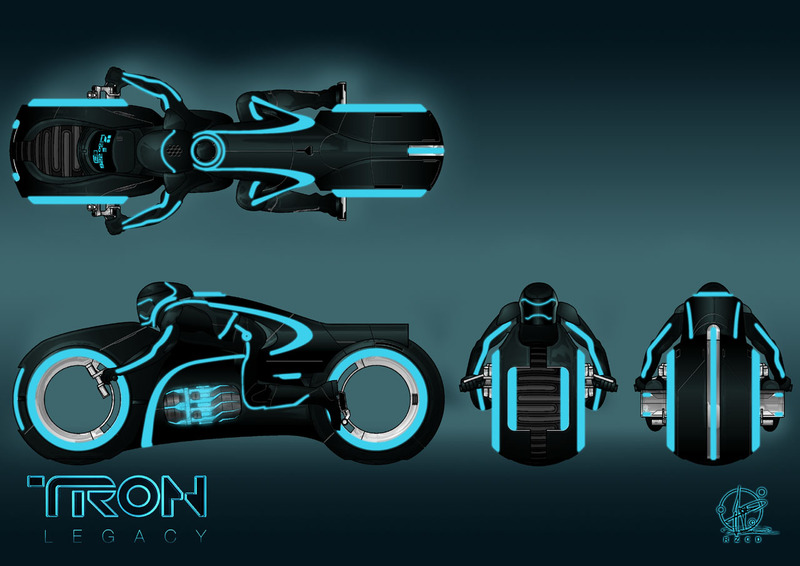 This model was inspired by iconic vehicles from the TRON movies – as it happens, the original TRON movie was released the same year I was born and I have a soft spot for it. The direct reason for me to try building it was discovering the electroluminescent – or simply EL – wires. EL wires work like a LED turned into a wire – they are flexible, they come in various lengths and colors, and they are evenly illuminated across their entire length. 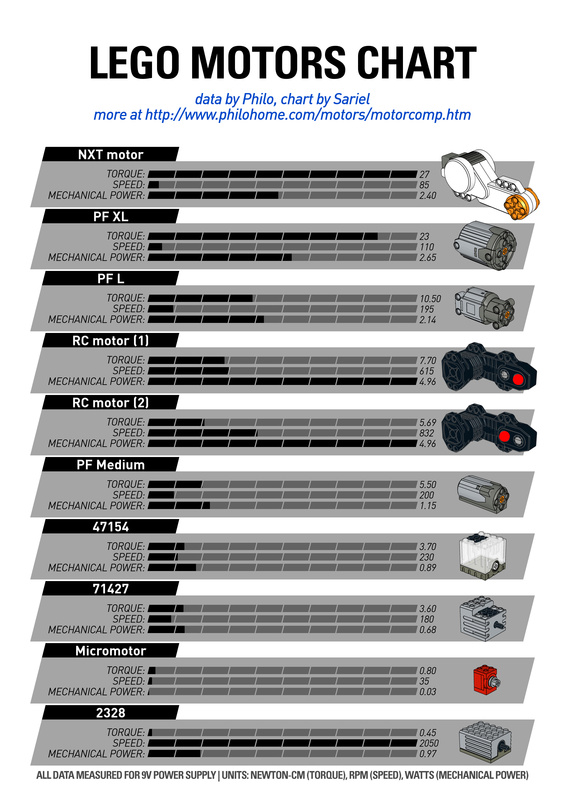 If we add the fact that they can be powered from small battery boxes and only need to have one of their ends connected to it, the resulting lighting solution is fairly easy to use in LEGO creations. The first – and essential – step to building the model was creating wheels that could be driven. The difficulty was that the original cycle’s wheels are hollow rings with illuminated edges. Since it was hard to make the entire wheels rotate while keeping their edges illuminated, I was trying to find a solution that would allow driving without actually rotating the wheels. I have started by building the wheels’ structure and wrapping double sections of 3L tracks around it – the idea being that rotating the track at any point of the wheel would make the entire wheel drive. I found out that this generated significant stress in the wheels’ structure which was being compressed by the tracks from all directions at once, and this resulted in plenty of friction and a jerky motion. Having abandoned the tracks, I have kept the same structure for the wheels and simply added tiny black wheels at their bottom, four for each wheel, with the idea that they would be hardly visible being so small and black. All four wheels in the rear “wheel” were discreetly connected to a driveshaft that went all the way to two hard-coupled PF L motors inside the chassis. 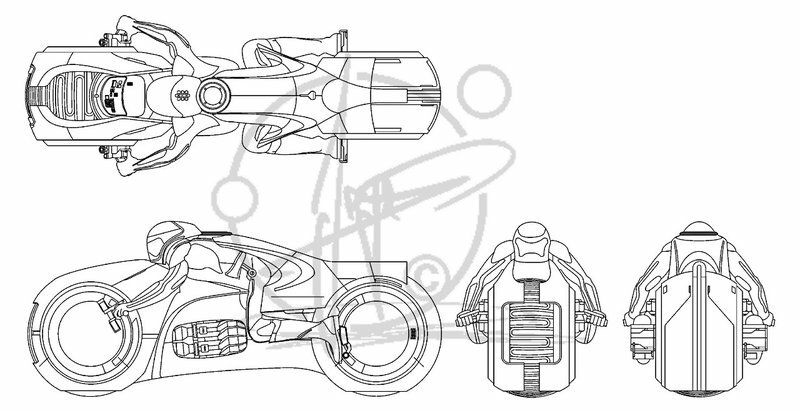 The front wheel was mounted on a vertical joint and turned left and right by a PF Servo motor in front of the chassis. The resulting vehicle was stable and able to drive smoothly, but the small wheels and the lack of suspension made it sensitive to any roughness of the ground. Additionally, the front wheel’s steering joint was stressed because of the weight and length of the model, and would bend a little when the model was picked up or put down. The lighting consisted of two parts, none of which was original Lego lighting. 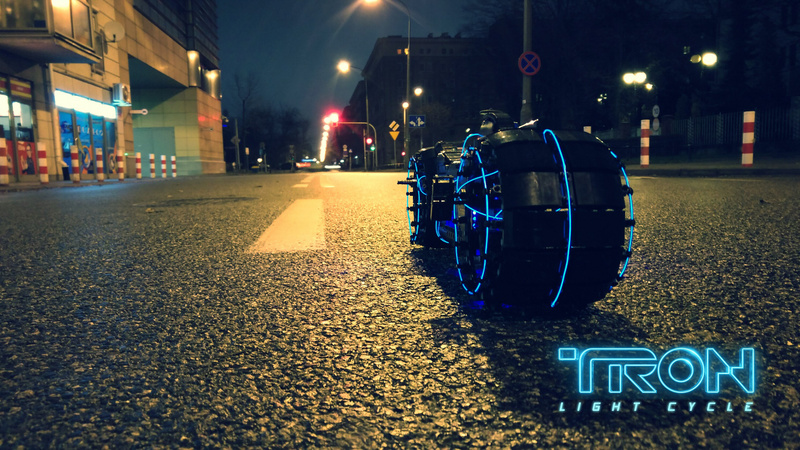 The first was a single 3-meters long section of a blue EL wire, which was wrapped around both wheels and sides of the model. It was quite a challenge to find a way to install it without cutting it and with only one end free to put through holes. In the end the entire wire is whole, uncut, and kept in place exclusively by Lego pieces, without any glue etc, and the experience of installing it was something like threading a spaghetti through a maze. The wire was powered from a battery box located inside model’s front, where a fuel tank would normally be. The second part were four blue Ansmann LED tubes, converted to be powered from a Lego PF plug by my friend. 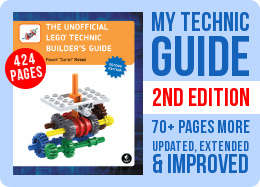 They were all enclosed in a long trans-light-blue Lego cylinder located horizontally in the middle of the chassis. One end of the cylinder was connected to the plug that powered the tubes, and the other was connected to a rotor of a sort, which was rotated by a PF M motor located below. 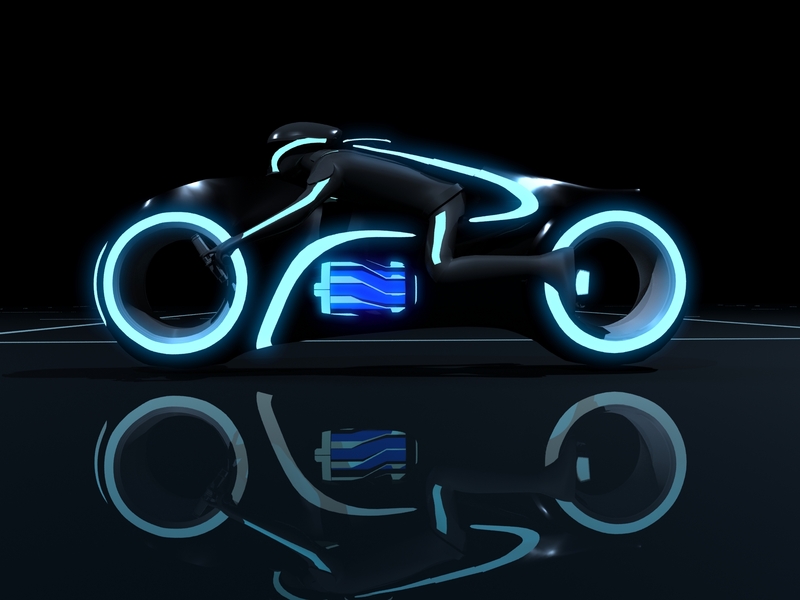 In the TRON: Legacy movie we can see the cycles having cylinder-shaped cores inside them, cores that seem to glow and rotate at the same time. To recreate the rotating effect, which looked like flickering horizontal lines in the movie, I have put a rotor with black Lego bars in front of the cylinder, and while the cylinder was static, the bars would rotate around it creating a semblance of rotation.